KazuTime for Android is a cool app that teaches kids the concept of time. It shows kids how much time is left to complete certain assigned tasks with the trifecta of cues – auditory, visual, and tactile. The app is meant for kids in the age group 3-8. You can download KazuTime for $2.99 from Google Play Store. 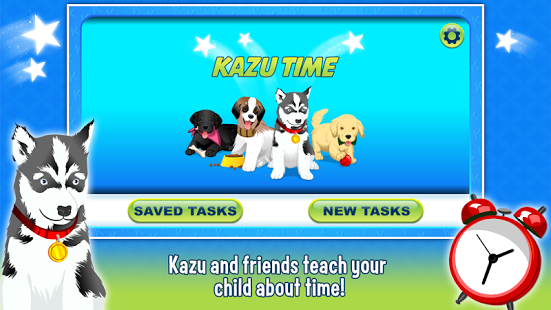 KazuTime app for Android provides an interactive way to teach kids the concept of time. You just got to set up tasks and allot certain time to complete said tasks. The app itself provides some motivation for kids to pursue the tasks that were created. As they perform the task, the in-app character named Kazu moves toward his end destination. The destination changes with the theme at hand. Once Kazu reaches his destination, the time is up. Or if the task is completed ahead of allotted time, a simple tap will put Kazu at his destination. You’ll earn shooting stars if the task is completed before the time expires. The app keeps track of how many shooting stars you’d earned. KazuTime app for Android uses a simple timer with audio and vibration options alongside user-set tasks for children to complete. That way, kids will have more than one cue to follow to track time. Parents and teachers can do their bit to personalize the app by uploading custom images and add a custom description for various tasks that are not found in the stock app. You can also save common tasks, meaning you don’t have to recreate them every time you need it. Users can also add in a buddy for Kazu as an optional task mode. KazuTime app for Android has a colorful and friendly design that incorporates different themes. It also features various task templates that you can assign to your kids. More importantly, the app is child friendly and appealing to kids. KazuTime app requires Android OS 4.0.3 or upwards. KazuTime for Android is an interactive, educational app that teaches kids about the concept of time. Layered with multiple cues that show time elapsing, KazuTime makes it easy for children to understand how time works. Setting up tasks is an easy process. The look and feel of the game is pleasing. You can get more themes via IAP for $2.99. The app is also stable and responsive. Check it out and let us know about your thoughts on it.